Total Sales for A Rational Arrangement, from 6/24/2015 to 9/30/2016: 1,496. Total Sales for Further Arrangements, from 2/1/2016 to 9/30/2016: 428. At this point, sales of A Rational Arrangement have not quite flatlined: it sold 5 copies in September. Likewise, Further Arrangements has almost stopped selling: 10 copies in September. I put both books on sale last week, at the same time I released The Moon Etherium. This move probably generated a few sales, but as the low totals show, they're still basically moribund. The Moon Etherium's first week of sales have not been impressive either: 33 so far. That's about half of Further Arrangements's sales in its first week, and less than a third of A Rational Arrangement's. My net income for my first year as an author was about $6,400: something like $5500 from ARA and $900 from FA. I'm happy with that total. It's by no means livable as a sole source of income, but it's nonethelesss much better than I'd expected to do by self-publishing. I didn't seriously expect ARA to make even a thousand dollars when I released it, much less over $5000. I really wanted to write this post because many of my friends saw that first Monthiversary sales report from me back in July 2015, and I think it conjured an image of my sales as much higher overall than they've actually been. Moreover, it might have left the impression that things would only get better: my next books would be as successful or moreso. Not so much. I don't anticipate that my second year will go as well as my first year. I intend to keep plugging away at this writing gig, regardless. What would I do if I didn't write, anyway? I will probably try some more new things. Perhaps some of them will work better! Or worse. Let's find out! Eighth Month Sales for A Rational Arrangement! These are the sale figures for my polyamorous fantasy romance novel, A Rational Arrangement. (Buy it here! Amazon ~ Kobo ~ Nook ~ iBooks ~ Print). With new, bonus sales figures for the second book, Further Arrangements! Sales Graph from June 24, 2015 through February 29, 2015. Miscellaneous sales: Draft2Digital sold 13 units of either FA or RA in February, and won't tell me which sales go with which book until next month. You're a little behind the reporting curve here, D2D. I am taking advantage of February being a short month to change these posts from "monthiversary" numbers that run from the 29th to the 28th, to month-end numbers. As expected, the release of Further Arrangements perked up sales for A Rational Arrangement. I put both books on sale for $2.99, which also contributed to the rise in sales. (RA got 3-4 sales at $2.99 before I announced the sale, after a week of zero sales). 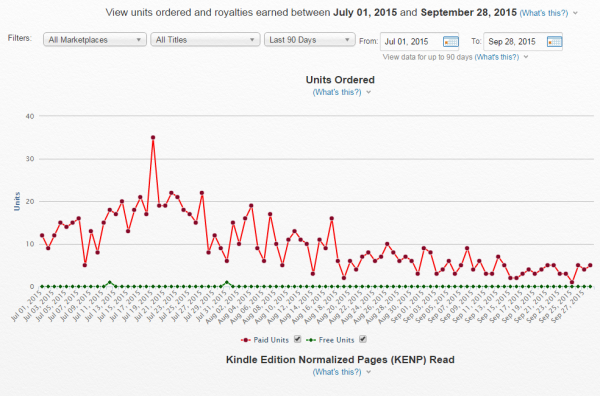 This was a nice bump: more sales than RA'd had in four months. As also expected, Further Arrangement outsold RA, though by less than I'd anticipated. Both books were priced at 2.99 for much of the month, because I goofed on sale pricing by forgetting to update the D2D prices, and Amazon price-matched RA at $2.99 for an extra 10 days or so after I meant to end the sale. Whoops. Anyway, total income is about what it was back in September (the third month). I'd hoped FA would sell 50% of what RA sold in its launch month. Actual unit sales were 32%: not dismal, but not great. The upside of this: I've been working on Birthright, an epic fantasy novel in a different setting from the Arranging Paradise books. If RA and FA had combined to reach the sales hights of July/August, I would feel more like I ought to work on a new Arranging Paradise romance instead. As it is, I feel free to try my hand at a different subgenre and see how what the market thinks of it. Seventh Monthiversary: Latest Book Sales Figures! These are the sale figures for my polyamorous fantasy romance novel, A Rational Arrangement. (Buy it here! Amazon ~ Kobo ~ Nook ~ iBooks ~ Print). Sales Graph from June 24, 2015 through January 28, 2015. So the good news: sales has held steady for two months! At a non-zero number! The bad news: Sales has also held steady for the last week, at exactly 0. Whoops. But there's more good news! I'm releasing Further Arrangements next week! Typically a new book in a series will increase sales of the previous books, so this may perk up A Rational Arrangement's sales. RA was priced at $4.99 for about ten days of the latest period, and then at $5.99 for the remainder. I plan to put it on sale again for the launch of Further Arrangements, perhaps even as low as $2.99. That will probably also increase unit sales. I also noticed that Amazon doesn't show RA categorized as fantasy any more. It's now in "Bisexual romance" (I don't think this category existed when I first launched -- I think it was all "LGBT") and "mulitcultural/interracial romance". "Interracial" is technically true and I remember checking that box, but I think "romance -> fantasy" is more to the point. The presence of greatcats and Blessings has much more impact on the narrative than the difference in races. I may fiddle with the keywords to see if I can get it lumped back into romance -> fantasy. In better milestones: A Rational Arrangement has now earned enough in royalties to qualify me for membership in the Author's Guild! I don't plan to join the Author's Guild currently; I find membership in SFWA useful and informative, but a lot of that is because it's got genre-specific resources and advice. I may someday join Romance Writers of America for similar reasons, but the Author's Guild doesn't hold that attraction for me. Sales Graph from June 24, 2015 through December 30, 2015. 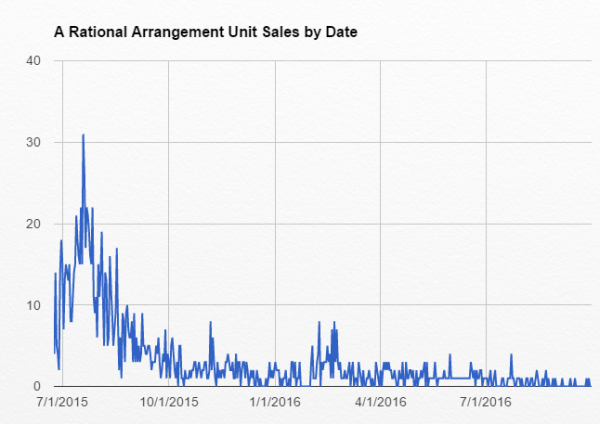 After holding steady for a month, unit sales are falling again. It will be really interesting to see how the trend for this book compares to the trend for the next book I release! 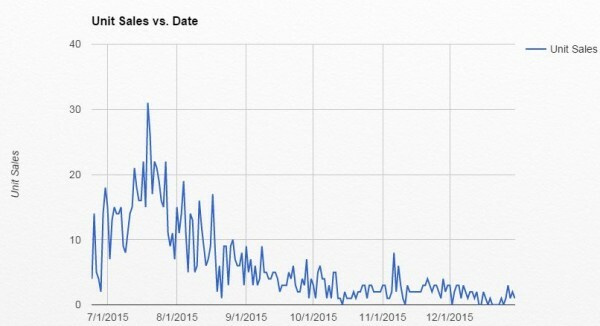 The $4.99 sale ended on 12/14, which I suspect is partly responsible for the resumed decline. I put the book back on sale on 12/26, in the hopes of catching some of the "I got a gift card for Amazon!" crowd. I hadn't planned to make $4.99 the permanent price until the serial wrapped up in March, but it's tempting to take that route now. I think I'll put it to $5.99 at the end of next week, just to see how that price point works out. Also curious if I'll get a sales bump on A Rational Arrangement when I release Further Arrangements (planned for February, at this point). I plan to time a sale on RA at the same time FA comes out. Sales Graph from June 24, 2015 through November 28, 2015. Woohoo! UNIT SALES DID NOT FALL! For the first month ever! I credit this to the sales price of $4.99 (down from $6.99) which began on 11/6: you can see the sales bump it created, and sales have been steady since. The halcyon days of summer have not returned, but I'll take it. Draft2Digital sold a book, as did Createspace. 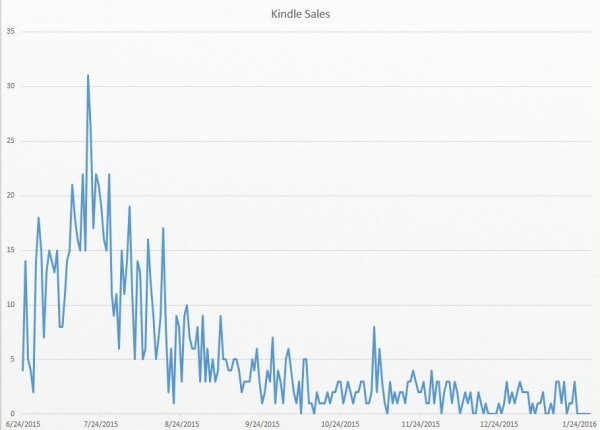 Amazon didn't have any zero-sales days this month, so that was cool. Net income is down from October, due to the lower price. But I will happily accept that! For one, I think more readers is better in the long term than more money is right now, and at $4.99 I figure these are buyers who plan to read the book, not people getting it because it's really cheap and they might read it one of these years. For another, it was not that large an income drop; less than 20%. Given that net income has been falling by 40-55% each month, having it drop by only a little is quite comforting. The sale ends on December 11, so it'll be interesting to see if the monthly sales decline resumes when the price goes back up to $6.99. Fourth Monthiversary Sales for A Rational Arrangement! I thought I'd do this on time this month, just for contrast with the third-month anniversary. These are the sale figures for my polyamorous fantasy romance novel, A Rational Arrangement. (Buy it here! Amazon ~ Kobo ~ Nook ~ iBooks ~ Print). Sales Graph for the last three months. I may stop including a graph on these posts, given that I can't give the Big Picture in one image any more. Also, I could just say "It's a line dropping by 40-55% per month" and that'd give the right general idea. The sales drop-off picked up a little speed, declining 54% over the last month. 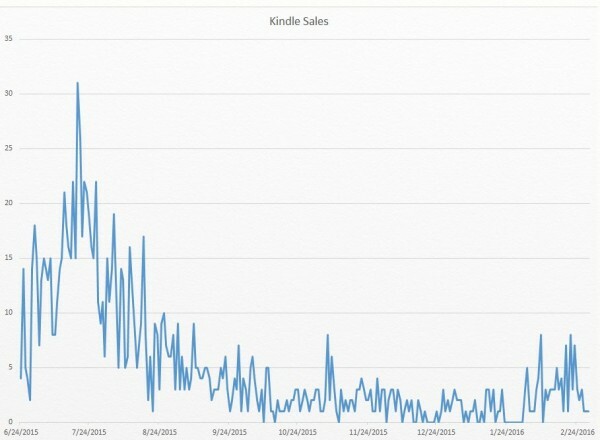 Non-Amazon sales dropped to zero this month (you're letting down the team, Kobo/B&N/iTunes). Amazon finally had a zero-sales day, on October 17th. Surprisingly, that remains the only zero-sales day, despite a string of days with one sale. Still psyched that RA broke one thousand sales this month. \o/ I can't believe that many people have found and bought my book. Go, little book! Be read! Tune in next month to see if the approximately 50% downward trend continues! A Rational Arrangement: Third Month Sales! It's been over three full months since the official launch of my polyamorous fantasy romance novel, A Rational Arrangement. (Buy it here! Amazon ~ Kobo ~ Nook ~ iBooks ~ Print). I've gone from checking on sales a few times a day (when it first came out) to checking a few times a week. Maybe my desire to check is tied to "whenever 5-10 copies have probably sold"? I did nothing to affect sales in September, and have no plans for October, either. On November 6, I'll be putting the book on sale for $4.99; this timing is connected to events in the serial. I may buy some advertising at the same time, depending on whether or not Marketer Rowyn comes out from under the kitchen table. In one last piece of sales news: RA didn't break 1000 units in September, but it did hit that milestone in the first week of October. \o/ SO EXCITED. 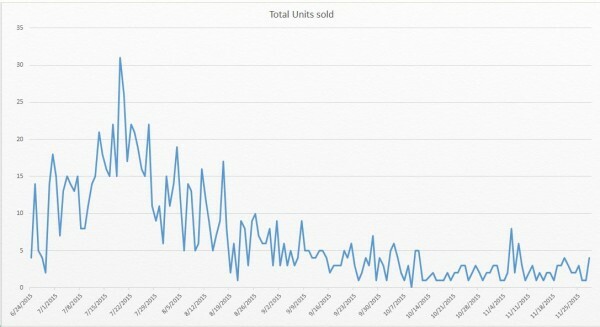 I'll close with a link for those interested in publishing numbers in general: Kameron Hurley's fascinating post on the average sales of published books. It's the second full month since official launch of my polyamorous fantasy romance novel, A Rational Arrangement. (Buy it here! Amazon ~ Kobo ~ Nook ~ iBooks ~ Print). That means it's time for DATA! Since I did a monthiversary post at the end of July, I figured I'd do another at the end of the second month, because I am still all excited about this whole "people are buying my book WHAT" thing. I will probably stop doing these at some point. August sales were uniformly down from July: I went from having frequent days of 20+ sales and most days having over 10, to no days that were over 20, and most days being 10 or less. For the first few weeks it was an up-and-down seesaw from day to day: 17! 6! 19! 7! The last ten days flattened out to around 6-7 a day. I have no good explanation for the flattening of sales at the end of August. My bad explanation is "the WorldCon effect": sf&f readers were attending WorldCon and have been buying/reading books they bought in person, and/or reading the Hugo winners, rather than buying new books online. This lines up with anecdotal reports from a few other authors who saw their sales drop in the same period, but I'm not sure WorldCon is the right explanation for the downturn. Sasquan's webpage shows 4,151 attending members, which is a pretty small slice of overall fandom. A huge media con like DragonCon (next weekend!) is more where I'd expect that kind of impact. This is highly unscientific. Also, while Amazon sales rank is heavily weighted by the most recent sales, it does take into account past sales in some fashion or other. * For anyone wondering why my previous post showed total sales of 550 while pre-launch and first-month sales on this one total 543: my last post included 7 sales from the second month, because I was giving totals to-date on July 30. ** In perfect seriousness, I do feel that the RA blurb should do a better job of establishing that the book is a polyamorous romance and two of the characters are bisexual. But I haven't thought of a way to do so that I like and find consistent with the rest of the book's style. The cover tagline, "It's not easy for individuals of a Certain Disposition to wed in Newlant. But surely three reasonable adults can come to a Rational Arrangement" was intended to suggest this in a way consistent with the book's themes. But it's still pretty subtle. Anyway, I don't actually want to trick people into buying a book they won't like, so I am totally good with a review that warns about it, especially one that does so in such a kindly fashion. This is the Amazon sales graph for my polyamorous fantasy romance novel, A Rational Arrangement. (Available at a URL near your mouse cursor! Amazon ~ Kobo ~ Nook ~ iBooks ~ Print). Graph by request of alinsa, who thought the sales graph in particular would be cool. I left the scale on because I do not care if the whole world knows how many copies it's sold. HERE, HAVE SOME DATA, WORLD. 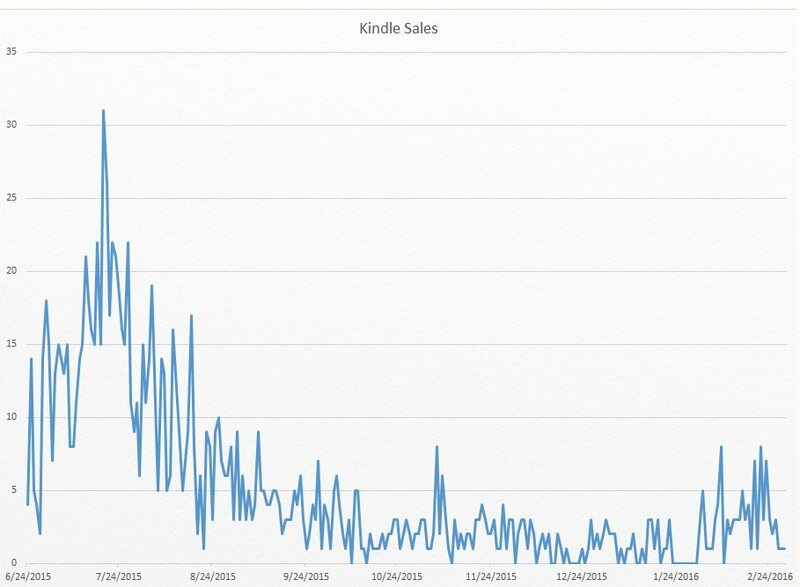 Incidentally, this is the graph that Kindle Direct Publishing gives authors when checking their reports. There are add-ons available for KDP, but I haven't gotten any because the basic page suits my purposes fine. The "days" are weird. I don't know when Amazon rolls its day clock over, because the downloadable spreadsheet they'll give doesn't have the same sales-per-day as the graph. Like the graph shows I sold 3 copies on 6/23 and 1 copy on 6/24, but the spreadsheet shows no sales on 6/23 and 4 copies on 6/24. Even stranger: it's not consistently "graph shows some sales with a datestamp a day earlier than the spreadsheet". Yesterday morning, the graph had 8 copies for 7/28 and 3 for 7/29, while the spreadsheet gave 11 sales on 7/28 and 1 on 7/29. Uh. Okay! Whatever, the overall numbers match up and this is still data a billion times better than what authors get from major publishers. 6/23: Uploaded book to Amazon at night. Alinsa bought a copy to make sure it was working. It was not. Alinsa ironed out an erratic problem with the .mobi's display of italics on some devices. Alinsa got it sorted (Amazon screws with the .mobi after upload and she has to make sure they can't mess it up with what they do). I re-uploaded on 6/24. 6/25: "Soft launch": Amazon copy looks good now! I let my Twitter followers know it's up on Amazon and propagating to other book-selling sites. (Kobo and Barnes & Noble already had it -- and were not affected by Amazon's glitchy handling of italics anyway -- but iBooks was dragging its feet). Several people retweeted the announcement. 16 copies sold! I was a little excited, and also a little "this is probably half of what I am ever going to sell, oh well." 6/29: Official launch! I pimped my book everywhere I have a web presence. I mentioned it was on sale ($2 off! Buy now!) I got a fair number of retweets and tweet-quotes on the lines of "buy it! It is good!" plus a tremendous boost from haikujaguar, who included a recommendation and link to it from her blog. 7/7: The last day of the $4.99 sale. I originally intended to have the sale run for 7 days, but that would've ended it on a Sunday, which is a bad social-media day. So then I planned to end it on Monday 7/6, but forgot my phone and so couldn't make a "last day of the sale!" announcement. So I ended it on Tuesday instead. My best guess is that most of the books during this period sold to people who follow haikujaguar. Not that people following me weren't buying it (I love you all!) but she has a much bigger audience than I do, and frankly, a third-party endorsement of a book is much more appealing than the author's own endorsement. Also, Micah released her Blood Ladders trilogy, which begins with An Heir to Thorns and Steel, just a few days after RA came out. So my book showed up on the "customers also bought" section of her Amazon page (and vice versa), meaning people who go off to buy her book were reminded that mine existed and might check it out. 7/8: Predictably, RA's sales dropped after the price increased to $6.99. 7/11: Unpredictably, RA's sales went back up. Lois McMaster Bujold released a new novella, Penric's Demon, on 7/6. Micah's new series is in the top results of Bujold's "also bought", and RA is in Micah's. RA started out buried at around #12 of Bujold's "also bought" list, but it eventually climbed to #5 (and is currently #6). So it looks like people are finding it either via Bujold's novella, and/or because Amazon is putting it on customer's home pages under "Recommended because you liked [X]" page. In any case, I started getting reviews from people who've never reviewed Micah's work but have reviewed Bujold's. One reviewer mentions that it was recommended to her because she liked Diana Wynne Jones's The Lives of Christopher Chant, which, wow, Amazon, that is SO SWEET OF YOU TO SAY. And also whacked because that is a YA/middle-grade novel and um RA really is not. But I still appreciate the thought! And she did like RA, so I guess it works? 7/19: I have no idea what happened that Sunday. Literally, I got nothin'. I hope it happens again someday. That was nice. 7/27: My average up through this day has been about 15-16 copies per day. Overall, it's been selling a little better per-day at $6.99 than it did at $4.99 (even discounting the slower sales prior to official launch). I think the early boost from Micah was critical to getting RA up in the Amazon rankings and into Amazon's recommendations algorithm. Without that, I am pretty sure the book would've stopped selling once the sale period ended. Sales through iBooks/Barnes & Noble/Kobo dried up at that point. So it looks like people who hear about me directly (via my social media or someone else recommending me) might go to those stores to buy it. But only Amazon is selling A Rational Arrangement without anyone else directly pointing to it. 7/28: In honor of my monthiversary, sales have decided to halve. Ah well. I don't know if the last couple of days are a fluke or a new trend towards lower sales. I'd be quite happy to have sales hanging around 10 per day, in truth. Time will tell. Days at $4.99: "Available" period was 15 days. "Official launch" period was 9. Total sales to date: 550. 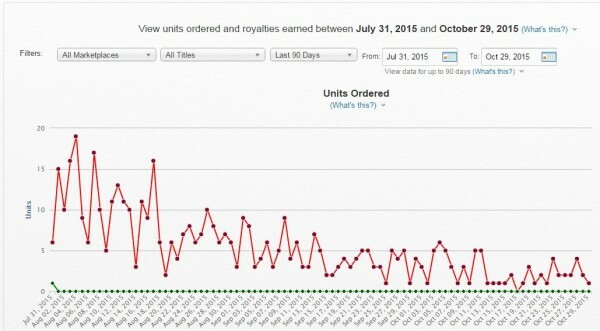 For a big publisher, 550 sales in the first month is "fire this author" territory. For me: I am floored. I am absolutely amazed that 550 people bought my book. People I don't know bought my book. People who don't even know anyone in common with me bought my book. WHAT HOW IS THIS I DON'T EVEN. I keep trying to picture it: a random stranger browsing Amazon saw the cover image that I created and Alinsa laid out and thought "that looks interesting". And then read the blurb I wrote and went "sure, I'll try it." This does not seem like it could happen even once, much less happen dozens of times. Seriously, my expectations were set at "eh, maybe 50-100 copies for the year". This does not exceed my wildest dreams (I am a fantasy author: my dreams get a whole lot wilder than this, believe me) but it still feels unreal. * Total sales is accurate, but the split between price points is +/- 5 copies, because the breakdown from D2D is less accessible than Amazon's, and I don't feel like untangling it. ** Okay, yes, it can change. Amazon lets you return ebooks. But it's not a huge factor the way "shipped" vs "sold" is wildly different with big publishers.